Blue Bench Restaurant and Bar brings Baxter's Road to Rockley Golf Course with an amazing and authentic Fish Fry. Make your selection for the fresh fish options and served with traditional sides. Beer Bucket Specials all night. Advance bookings receive a complementary glass of Badman Rum Punch to start the night. Blue Bench Restaurant (Formerly Fairways Cafe and Bar) is located at Rockley Golf & Contry Club overlooking the beautiful Greens of the Gold Course on onto the 9th hole. Their services include Lunch as well as Dinner with a selection of delectable delights. Their Bar is heading to be Best Little Cocktail Bar on the Island serving up specialty cocktails including their Brewed & Poured, Badman Rum Punch - come & judge for yourself & challenge the experienced bar. 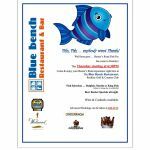 Blue Bench Restaurant is open to the public Mon to Sat 11am to 9pm for food. Cocktail Bar closes at 11pm.